Do you know what does IT mean? 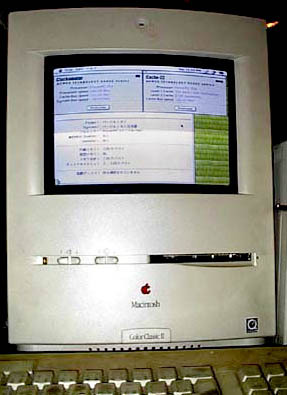 This monitor is ColorClassic's. 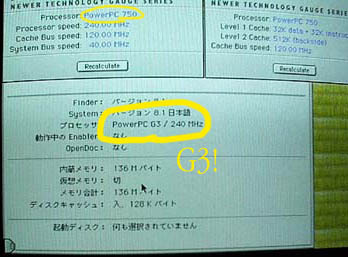 This runs on Japanese system, but you will be abled to read "G3" lettering. Takky Tune enables to install Alchemy logic board (PF54XX, PF64XX) and Gazzele logic board (PF55XX, PF65XX). It enables to install "Booster 64, 54 G3 240". But you need to establish more power supply (3.3V, 4.6A) at analog board P8 connector (only Alchemy). This ColorClassic's P8 source is supplied from P12 connector using 3.3V regulator with heat sink. 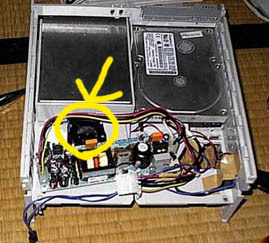 The aditional power supply near this fan supplies to HDD and cooling fan. This is not the logic board additional power supply (3.3V, 4.6A).